Wrap your baby in the comfort of the original swaddle wrap, SwaddleMe, and rest assured baby will sleep safe, sound and secure. Swaddling soothes newborns by recreating the familiar, comforting snugness of the womb and helps prevent the startle reflex from waking them so babies, and parents, sleep more soundly. Recent research shows that swaddling may help reduce the risk of SIDS by promoting better sleep when infants are on their back. Leg pouch for easy diaper changes: The leg pouch pops down for easy diaper changes with no need to unwrap baby's arms. 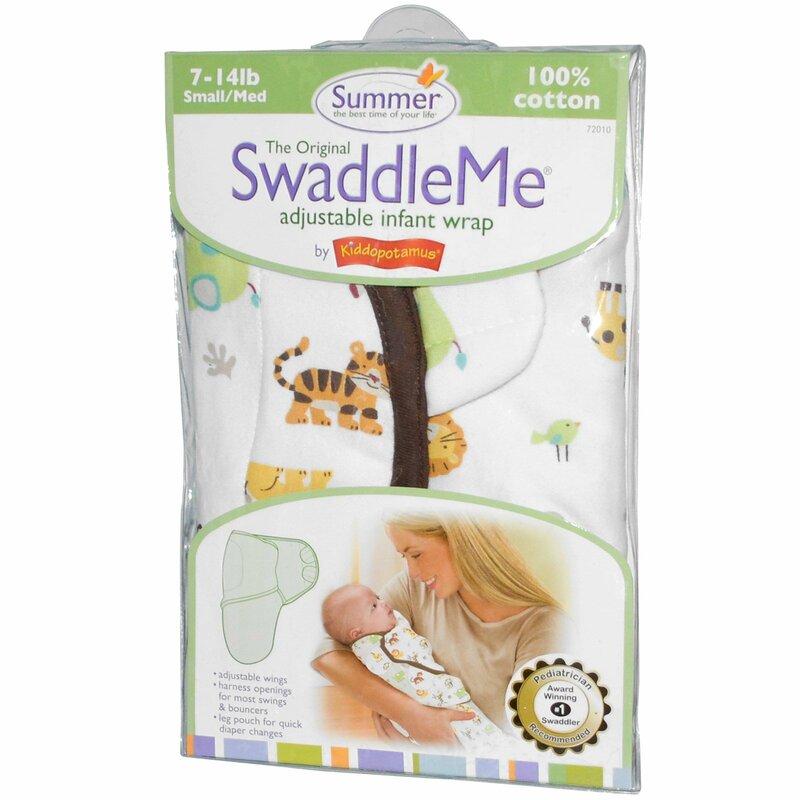 Works with most 5 point harness: Insert the harness through the slit in the back of the SwaddleMe, seat baby, connect the harness and then fasten the wings. Grows with baby: Fabric wings hug baby close and stay secure in place with self-fasteners. As baby grows, the wings can be adjusted for a perfect fit. Align baby's shoulders with top of open wrap. Tuck legs inside leg pocket then open tab at top of leg pocket. Wrap left wing over baby's torso and tuck under baby's opposite arm. Secure tab to top of leg pocket. Place right wing over left and secure opened tabs to fabric patch on left wing. Wings should be snug over baby's chest. Always place babies on their backs to sleep. Care Instructions: Wash before first use. Close the 3 tabs before washing. Machine wash cold, gentle cycle with like colors. Use non-chlorine bleach only if needed. Tumble dry, low heat. 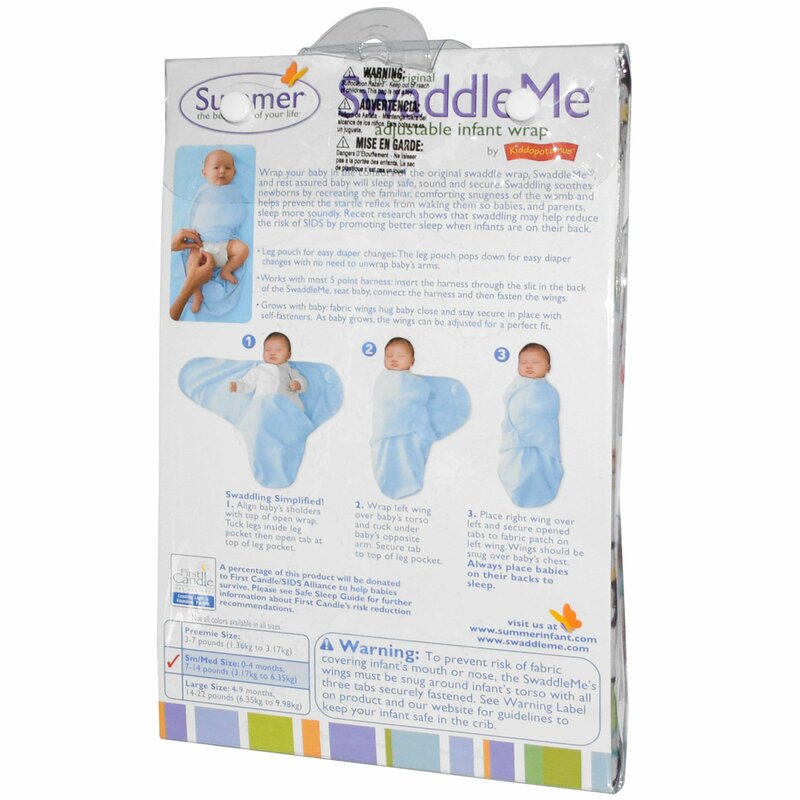 To prevent risk of fabric covering infant's mouth or nose, the SwaddleMe's wings must be snug around infant's torso with all three tabs securely fastened. Suffocation Hazard: Keep out of reach of children. This bag is not a toy. Exclusive of decoration: 100% cotton knit.